Remember when I said that Survivor seasons are much better the second time you watch them? Well this moment is a perfect example of what I am talking about. A lot of my favorite moments on the Funny 115 are things that weren't necessarily funny the first time you saw them. Rather, they are moments that got a lot funnier once you knew how the season was going to end. In fact, most of these moments you might not have even noticed the first time around. Moments like these (the ones that are only funny on repeat viewings) are the ones that I like to call "retroactively funny." And they are some of my favorite moments on the entire countdown. Even if, at the time, they were only funny and/or ironic to the editors. A good example of a retroactively funny moment is Jon's "I guarantee Sandra's not the winner!" confessional at the start of Pearl Islands. It's a quote you might not have even remembered the first time you watched Pearl Islands, but I can guarantee you that it stands out to you during the second viewing. 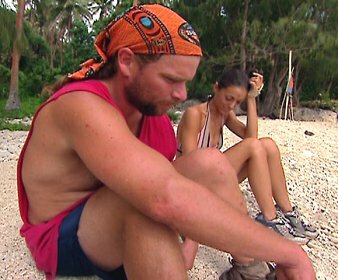 And there are moments like that all the time in Survivor. The editors love to use foreshadowing. The editors love to tip off how the season is going to end. And I have to imagine they are laughing their asses off when they put those scenes in the actual episode. Because if can you recognize a foreshadowing scene for what it is, if you can spot a retroactively funny moment the second time you go back to watch a Survivor season, it often becomes one of the funniest moments of the entire season. Case in point: The 13th episode of Survivor: Vanuatu. Chris Daugherty is in full-blown liar mode by this point, he is just lying through his teeth to just about everyone. He's dumping the most convoluted and elaborate lies to everybody, he's weaving four different storylines depending on who he is talking to, and I have no idea how he is able to keep it all straight in his head. Every single person Chris talks to gets a different story about the deal they have to the final two. And every single person gets a different scenario about how Chris is going to get them to the final vote. And after a while, with so many stories and scenarios floating around, you would think that Chris would accidentally slip up and tell somebody the wrong story. Right? Wouldn't the odds be pretty good that Chris might slip up and accidentally tell somebody the wrong thing? Well in episode thirteen we hit the jackpot. Because Chris does screw up when he is talking to Eliza. And he does it right on camera, too! Chris accidentally tells Eliza the wrong storyline, Eliza catches him on it, and then Chris does the clumsiest recovery possible in an attempt to get her to forget it. It is a rare glimpse into the twisted mind of Chris Daugherty, and it shows that even he gets confused by his web of lies sometimes. It also happens to be one of my favorite retroactively funny moments in Survivor history. The scene: It's down to the final five, and Chris has two alliances he can ride all the way to the end. He can either go with Julie/Eliza, or he can go with Twila/Scout. Chris's ideal plan is to go with Twila/Scout (because they are older and easier to beat in the challenges), but he's keeping Eliza strung along just in case he needs her vote somewhere along the line. So even though Chris has no intention of taking Eliza to the final two, he definitely doesn't want her to know this just yet. Eliza needs to think that Chris is going to take her all the way to the final two. So Eliza and Chris are sitting on the beach right before the immunity challenge in episode thirteen. And they are shooting the breeze about how the rest of the game is probably going to play out. And... well... let's just say that Chris is a little careless in his word choice during this conversation with Eliza. Because he accidentally (and absent-mindedly) tells her the storyline that she really isn't supposed to be hearing. It's hilarious. Take a look. CHRIS: "Everything's good. We just have to see how this immunity challenge goes. And if, you know, and if it falls in the right direction, we'll talk." CHRIS: "And do what's best for us." (Chris then turns to look at her) "... To the final three." ELIZA: "Oh yeah." (She pauses for a second, then looks up and corrects him.) "... The final two." Chris is silent. He doesn't realize he just screwed up. Then realization hits him. He does a mini Chad gape. CHRIS [quickly correcting himself]: "Well yeah." (He's stammering) "I... I mean..." (He pauses, then looks at her and nods, sincerely.) "Right." Like I said, this moment is only funny if you know how Vanuatu is going to end. And that's why I call it retroactively funny. It's not something you would even notice the first time you watch Vanuatu, but the second time you watch it, it will crack you up. This scene is the only time that Chris screws up one of his storylines during Vanuatu, and it is one of my very favorite "oops" moments in Survivor history. 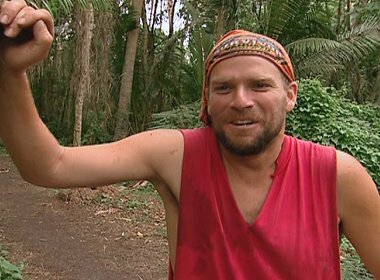 If you ever go back and re-watch Vanuatu, keep an eye out for it. I can't believe I accidentally said that!